The 2015 World War II drama Come What May is directed by French filmmaker Christian Carion (Joyeux Noel). 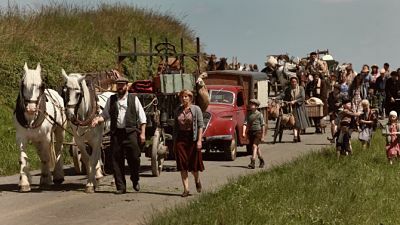 May 1940: To escape the imminent German invasion, the inhabitants of a small village in northern France flee their homes, like so many millions of their compatriots. Max (Joshio Marlon), a German boy, travels with them. His father, Hans (August Diehl), opposed the Nazi regime and was imprisoned in Arras for having lied about his nationality. Hans is eventually set free and sets off to find his son, accompanied by a Scottish soldier (Matthew Rhys, TV’s The Americans) who is trying to get back home. Generally considered to be competent but undistinguished by the critics—it garnered a not-so-great 38% positive rating at aggregator Rotten Tomatoes based on 16 published reviews—the movie received a limited Stateside theatrical release in September, 2016. Presented in French, German and English with optional English subtitles, the DVD and Blu-ray incarnations of Come What May include of handful of bonus features, including a behind-the-scenes segment with the legendary composer of the film’s score, Ennio Morricone (Once Upon a Time in America).